Duty Ammo | Ammo & Bullet Mfg. Inc. The brave men and women of our police forces face challenges and risks every day. Since they have sworn to protect civilians from wrongdoers, they need to be equipped with the most reliable, top-notch duty ammo in the industry. Police duty ammo can penetrate deep enough even after going through other objects. There are two basic types of duty ammo: police duty bullets and personal duty bullets. The former is the practical choice if you are facing an offender wearing heavy clothing or need to slow down a criminal inside a car. The structure of this duty ammo is designed to push past tough barriers. Although the builds of these two types of duty ammo look similar, they function differently. Heralded for its superior barrier performance, police duty ammo can still expand and penetrate the target even after passing through metal or glass. If you need ammunition that can perform as expected during a police confrontation, you need to turn to the specialists. Ammo and Bullet can provide the duty ammo that you need. We also accept orders for beyond standard ammunition. Personal duty ammo is designed to readily hit soft targets. 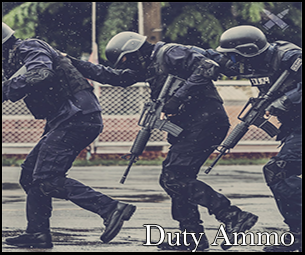 Compared to police duty bullets, personal duty ammo is structured to expand and penetrate readily in situations that call for self-defense. Its ability to rapidly expand makes it the ideal choice for soft targets. This type of duty ammo is usually shot from shorter barrel lengths. Personal duty ammo is designed to expand at lower velocities and after going through heavy clothing. Unlike police duty ammo, it may fragment and not completely penetrate a thick barrier when shot through one. However, personal duty ammo works best when directly used against soft targets, such as a shirtless criminal or an offender wearing light clothing. If you would like to learn more about personal duty ammunition, our staff at Ammo and Bullet will be more than happy to answer all your inquiries. High-quality duty ammo can make all the difference when you are on duty. Having the best firearm would be pointless if the duty ammo you are using is subpar. As part of the law enforcement community, you need to equip yourself with the finest duty ammo that can function well even with a regular gun. When you have the right tools, you can become more efficient in your job. During a police confrontation, you need duty ammo that can stop criminals fast before they cause further harm. Manufacturers understand that the quality of your bullet can make a big difference in such a scenario. As such, they create duty ammo that will meet all your demands. Getting a supply of top-notch duty ammo can be easy if you have a reliable manufacturer on your side. Fortunately, Ammo and Bullet can give you exactly what you need. An ammunition manufacturer located in Maine, Ammo and Bullet is committed to creating and developing reliable, first-rate duty ammo for the brave police officers that protect our people. We also produce high-quality bullets for sharpshooters, weekend warriors, and firearms enthusiasts. Read this article to see how much ammo and guns DHS is actually buying: https://www.forbes.com/sites/larrybell/2013/03/10/why-the-heck-is-dhs-buying-more-than-a-billion-bullets-plus-thousands-of-guns-and-mine-resistant-armored-vehicles/#146100f84ec3. Ammo and Bullet produces premium-grade ammunition that performs excellently with every shot. If you are interested in getting quality rounds, our team can be of assistance. For more information, contact us today! Are you looking for the right ammunition maker? Look no further than Ammo and Bullet. Call us at (888) 407-0240 or fill out our form to place your orders and to learn more about our products. We are available from 9AM to 5PM. Partner with us, and we’ll help you get reliable ammunition.